Have you ever read something about an artist & thought, “Yes! Me, too!!”? That’s how I felt when I read the following quote at the Van Gogh: Up Close exhibit at the Philadelphia Museum of Art last Saturday. “For Van Gogh, the blade of grass became a metaphor for living simply & observing the surrounding world with thoughtful attention, a practice that grounded his personal & professional life.” That quote deeply resonated with me because I, too, am trying to stay grounded by connecting more intimately with nature. 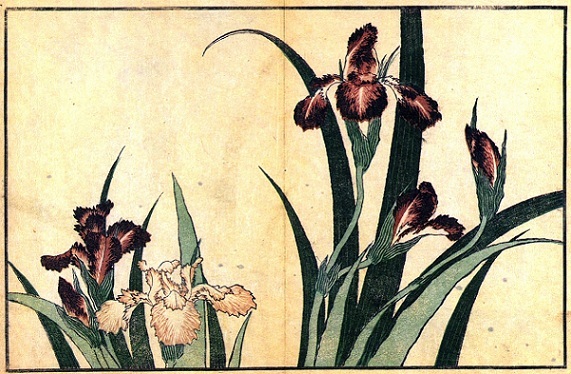 Several Japanese prints similar to those Van Gogh collected & used as sources of inspiration were also on display. The prints were absolutely beautiful! In the museum gift shop, I purchased 2 books on them & have spent the last few days studying the work of Hokusai specifically. 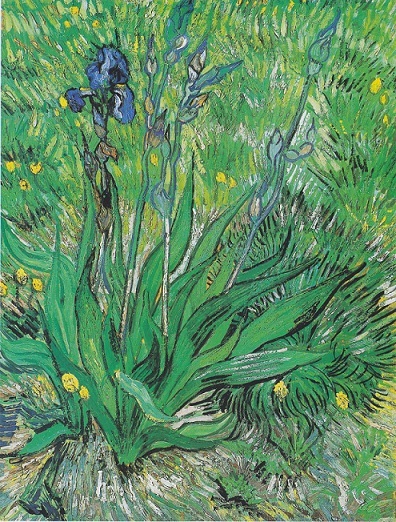 Take a look at Van Gogh’s inspiration & see how he interpreted similar subject matter. Artists get inspiration from nature & one another. 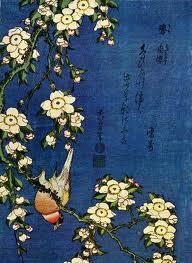 Van Gogh & Hokusai make the surrounding landscape fall away, gently forcing the viewer to focus on the subject. They capture a moment, a mood. Each work is a visual haiku. 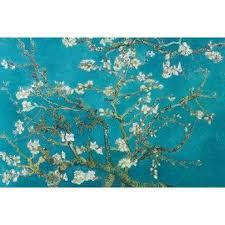 At times, my inner critic tells me that my work is too simplistic but then I remind myself, ‘That’s the point.” One blossom. One bird. One pine cone. Oneness. I have the intention of starting each day in nature, offering a prayer of gratitude or blessing, no matter the weather. I’ve set this intention before but sometimes the bed is so cozy or the day so cold that going outside to pray takes a lot of effort. I’m so glad I did this morning. It was cool & foggy in the predawn hour. Secluded & silent. The world belonged to me, my cup of coffee, & my dogs. I gave thanks for my many blessings then lifted my eyes to the maple tree praying next to me (or perhaps it was listening to my prayer). I gasped with amazement & awe. The patio light illuminated tiny, perfectly-formed droplets of dew on every blossom & twig. It also revealed countless delicate spider webs, draping the tree like glittering garland on a Christmas tree. Dewdrops are more precious than diamonds, in my eyes. There is nothing man-made that can surpass the beauty inherent in nature. I’m no poet & my words will never do justice to the magic of being PRESENT this morning. This morning is definitely one of the most memorable experiences that I’ve ever had. Others including a perfect rainbow arching over my house a month or so ago (how tempting to search for the pot of gold) & a moment in the mountains when the world was black & white like an Ansel Adams’ photograph because bare trees black with wetness contrasted so dramatically with the fluffy white snowflakes that landed on them. What richness there is around us when we take time to see! 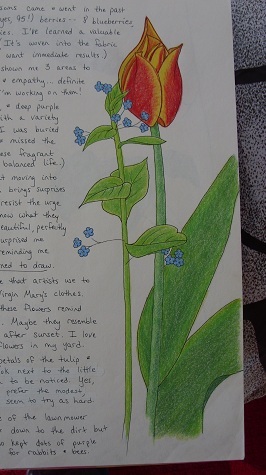 This morning, I discovered a hidden treasure at the bottom of a pile of sketchbooks– my nature journal. 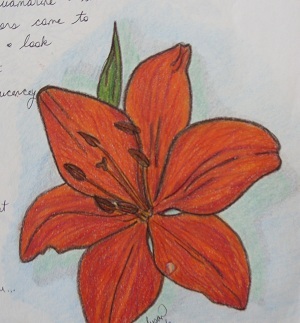 I began it in 2005 & stopped sketching in it late 2010. The pictures have inspired me to spend time in my yard, rediscovering the beauty right here at home. The color of each blossom moved me to layer colored pencils to get the right effect. Daffodils arrived earlier than expected this year. I adore the rich red-orange of this exotic bloom. Often, I pick up interesting objects when I walk the dogs. Eventually, they make their way into my sketchbook. I collect feathers of all kinds. Wispy & ethereal, they symbolize air & freedom to me. I can never draw enough leaves. Each is so unique. 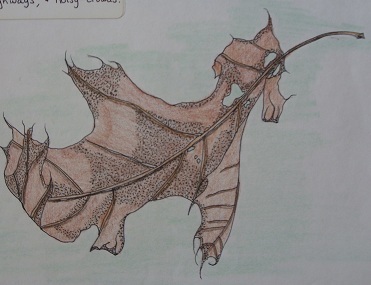 Dried autumn leaves inspire me most. 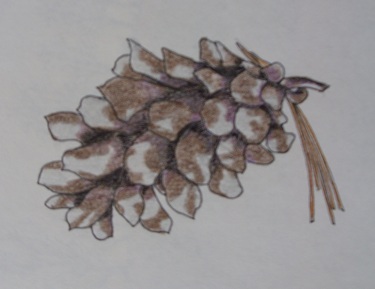 Both the shape of the pinecone & the areas of light & dark make them a challenge to draw. Mourning doves are probably my favorite birds. I love their coo as they call to one another from rooftops or telephone lines. 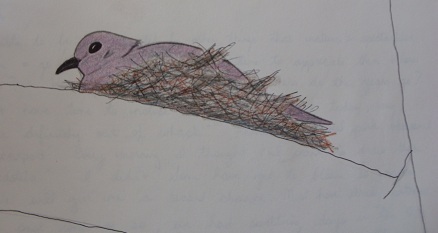 This one built a nest in my front yard which afforded me the time to draw her & blend my colored pencils to replicate the gray-lavender of her feathers. As her black eyes peered into mine, I couldn’t help but wonder what she was thinking. Mourning dove protecting her nest of eggs. Sometimes, things grow so slowly that the change is hardly noticeable. 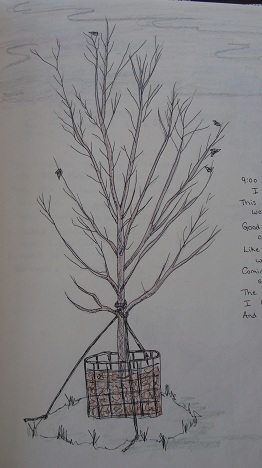 Here are drawings of my maple tree 5 years apart. While it has been home to many birds who find safety in the birdhouses I place there year after year, I hope the tree is strong enough to embrace a nest this year. 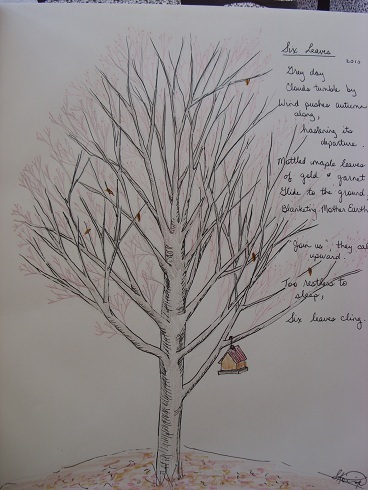 My maple tree in 2005. Here she is in 2010. This reaffirms my passion for all things natural but specifically for the local beauty of the area where I live. A very talented Hindu in my community inspired this piece. I couldn’t resist the urge to sketch him as he shared his deeply moving music, becoming one with his drums, entering an altered state of consciousness, & pausing to chant as the spirit moved him. Over the years, I’ve experienced drumming from a variety of spiritual traditions including pagan drum circles & Native American powwows where the drum connects the drummer to the Divine… a form of prayer or meditation. These ceremonies & rituals aren’t drum “performances” but a way to direct participants inward. 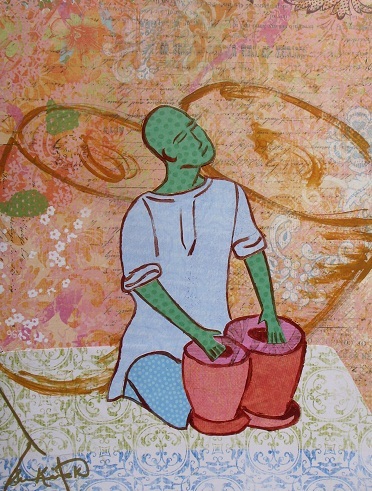 Shamans are able to take this to another level, journeying to other realities on a drum beat. Connection to Self. Connection to Spirit. Drumming may not be part of my heritage but the fact that it moves me (& so many other people) tells me that it’s worth exploring for myself. flowing after months of tired browns & greys are the energetic pastels of spring– joyful blues, yellows, greens, & pinks. 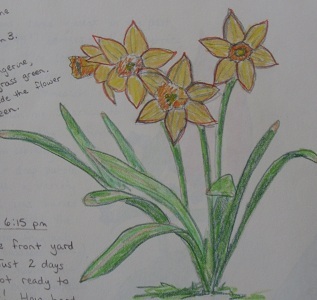 My senses celebrate every fresh breeze, budding tree, & blooming daffodil. This past week, I’ve especially delighted in soaring, swooping, singing birds– my little feathered muses. Over the past 6 years, I’ve turned a barren backyard into a wildlife sanctuary full of native plants, bird feeders, & a stone birdbath hoping to provide a habitat for birds who, in turn, provide inspiration for me. I laugh out loud, watching songbirds & robins inspect the 18+ birdhouses I have scattered around my property. They’re looking for the perfect place to have their babies. They flit from one house to another, peering inside, considering their options. Location, location, location. 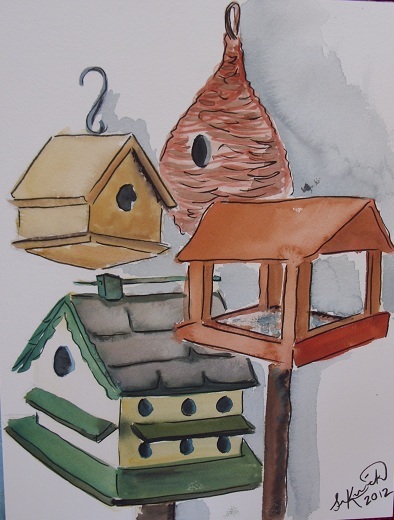 I’ve seen Househunters & Househunters International on HGTV but I can only imagine a series called Househunting for the Birds 🙂 The comical scene inspired me to grab my sketchbook & get cozy on the sunporch. 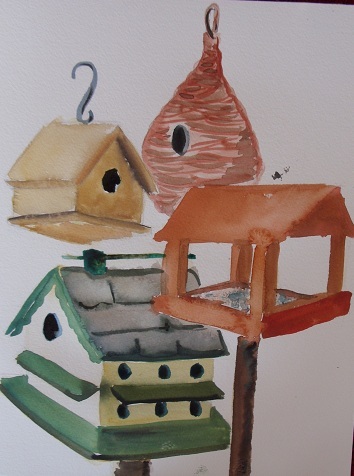 I just bought Grumbacher’s Opaque Watercolours so I turn my favorite birdhouses into a quick watercolor study so I can play with my new art supplies. 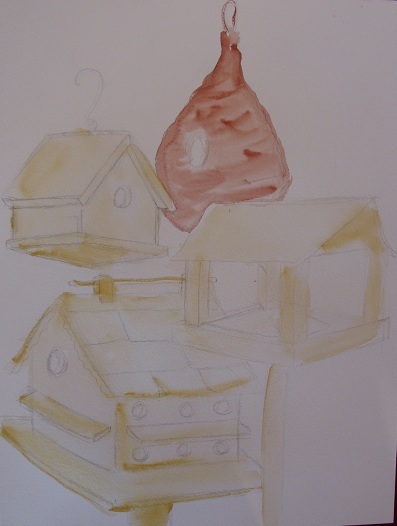 First, I wash yellow ochre over each house. Then, I go back over them with richer colors. 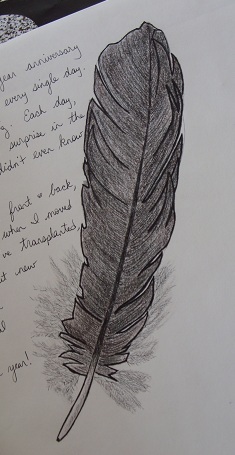 Lastly, I use a permanent black fine-point marker to add an outline & details. A light wash of color makes the composition cohesive. Rich, earthy colors give the piece interest & depth. A fine-tip marker gives detail. Inspiration isn’t far away when my muse is in my own backyard. I have loved reading ever since I could hold a book. One unforgettable summer day when I was no more than 6 or 7, I relaxed in a lawn chair at my grandparents’ house & immersed myself in Grimms’ Fairy Tales, the first book that I read cover to cover in one sitting! I recall my grandmother bringing a sandwich & chips on a paper plate so I could eat & continue reading at the same time. She wisely fed two hungers at once. In college, I had an English Lit professor who introduced me to great literature & also explained the concept of banned books. What?! I couldn’t imagine such a thing was (and frightfully still is) true. People have tried to suppress ideas that they don’t agree with for ages. Race, gender, sexual preference, religion, & cultural differences are used to justify discrimination by narrow-minded people acting out of fear & ignorance. The good news is that while they seem to “win” in the short-term by banning or even burning books, wisdom, love, understanding, & tolerance ultimately win in the long-term. 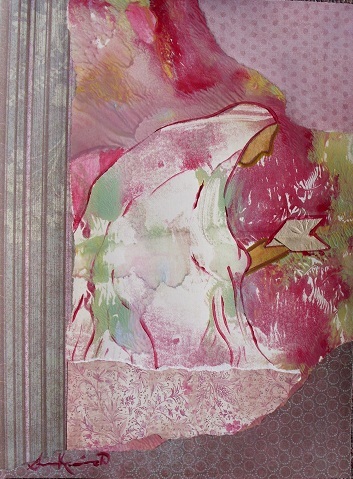 My collage, Read, shows a very tranquil person studying a text. We don’t know who this is or what is being read. It doesn’t matter. The point is the subject is reading… immersing in ideas that may or may not agree with firmly-held beliefs, stretching & growing as an individual. Each book I read takes me to a faraway place, teaches me something I don’t know, or opens my mind to opinions other than my own. Reading is the key that not only opens doors but can blow them right off their hinges. By reading, we may find that we have more similarities binding us together than we thought. Deep gratitude to my grandparents & others for exposing me to great world literature, allowing my imagination to take wing, & introducing ideas that have shaped my life.